French roulette is a European-style roulette game variant with a single zero. Even as it is often mistakenly called 'European roulette', it is a separate and self-sufficient type of the casino roulette game. The game of roulette itself in its actual form comes from France. Even the origin of the word 'roulette' (meaning 'little wheel') is French. 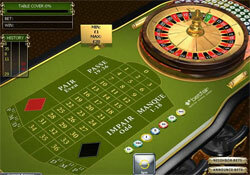 Thus, French roulette may be seen as the predecessor to the European and American roulette game varieties. And despite the similarity of the wheel and general game rules, French roulette has its own unique features that differentiate it from the other variants of the game. The wheel in French roulette is the same as that in European and American roulette. It has black and red color pockets on it that represent numbers from 1 to 36 and a single zero. Numbers on the wheel are arranged in a certain order corresponding to that on the European roulette wheel. The basic difference of French roulette compared to the other variants is that all numbers on the layout here are red. This doesn't really affect the rules of the game as the wheel still has red and black numbers. It may be considered as a special design style preferred by the French. The rules of French roulette are quite the same as in European and American variants. The players are to make their bets on possible winning numbers on the table layout. Bets can only be made until the ball launched by the croupier starts losing its speed and is ready to fall into one of the pockets. The pocket the ball fall into defines the winning number. The croupier then distributes payouts or sweeps the lost bets off the table. The players can make inside or outside bets. Inside bets are bets on a single number or on a small group of numbers according to their vicinity on the layout. They pay the most but are at the same time almost improbable just as it is almost impossible to guess the exact number the ball will land on. Outside bets are made on larger groups of numbers (like Dozens - 1st, 2nd or 3rd 12 numbers on the layout or Columns - vertical lines 12 numbers each) or on Even/Odd, Black/Red or High/Low numbers. French roulette offers two rules to the players' advantage. These are the La Partage rule and En Prison rule. Both rules come into effect when outside bets are made and the outcome is zero. La Partage rule means that when zero is the result of the spin, the player loses only half of his or her bet. According to the En Prison rule, the player gets an opportunity to postpone his or her bet for the next game. If the second bet wins, the player gets it back, if it loses, the player loses the bet respectively. With another zero outcome the bet will be postponed for yet another spin.